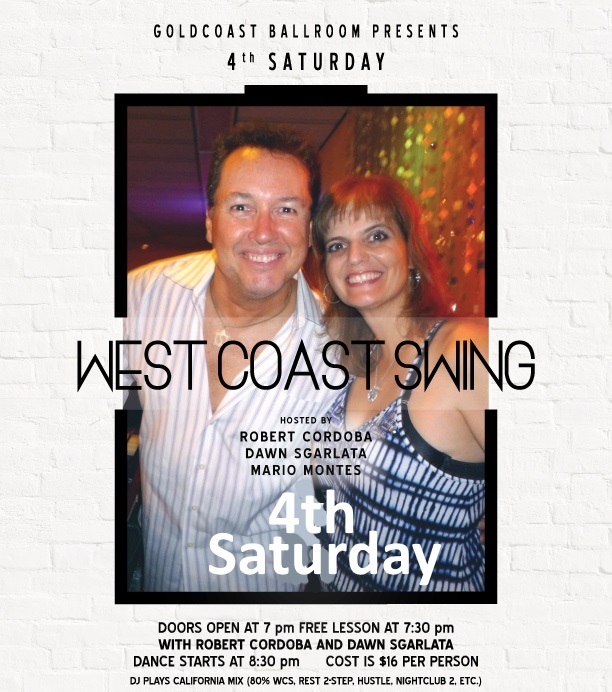 Goldcoast Ballroom & Event Center | West Coast Swing Class – with Robert Cordoba & Dawn Sgarlata – 7:30 PM – 8:30 PM (Warm up music starts 7:00 PM) – COMPLIMENTARY with paid Admission to West Coast Swing Saturday Dance following the Class!! West Coast Swing Class – with Robert Cordoba & Dawn Sgarlata – 7:30 PM – 8:30 PM (Warm up music starts 7:00 PM) – COMPLIMENTARY with paid Admission to West Coast Swing Saturday Dance following the Class!! With Robert Cordoba & Dawn Sgarlata!! WEST COAST SWING 4th SATURDAY DANCE!! Hosted by Robert Cordoba, Dawn Sgarlata, and Mario Montes!! Robert Cordoba has been dancing, teaching, performing, choreographing and judging for over thirty years. He began dancing West Coast Swing in 1990 and within two years he won his first U.S. Open title.For the past twenty years Robert has averaged approximately forty weekends per year traveling around the world to teach West Coast Swing. His impressive list of accomplishments includes: 7 U.S. Open titles, 4 consecutive USA Grand National titles, 4 consecutive N.A.S.D.E. titles, multiple J&J and Strictly Swing titles, was voted best Classic Swing Dancer by Dance Action magazine, was awarded “U.S. Open Social Dancer”, and he was the first person to win 3 consecutive US Open titles. Robert is a member of the “Super 7″ – dancers who won BOTH the Showcase and the Classic Divisions at the U.S. Open. He is a California Swing Dance Hall of Famer, Dallas D.A.N.C.E. Hall of Famer and a World Swing Dance Hall of Famer. Dawn Sgarlata. For over 20 years West Coast Swing has been Dawn’s passion. She has competed across the country in many swing competitions and has placed in many Jack-n-Jill and Strictly Swing contests. She currently competes at the All-Star level. She gained knowledge and experience from many years of training with top dance professionals and is a GPDIA certified teacher (Intermediate level). Dawn currently teaches privates and small group classes in the Wellington and West Palm Beach area.